High prices for drugs, vaccines, and diagnostic tests limit access. When drugs are expensive, they may be excluded from reimbursement programs, have restrictions on how they can be used, or be subject to high co-payments. Patients may also avoid purchasing expensive (to the patient) prescriptions. In developing countries, high prices can have devastating impacts on access. A 2011 study by Paul Miano found no patented cancer drugs on the World Health Organization (WHO) list of essential medicines. The exclusion of virtually all drugs newer than 15 years old was powerful evidence that high prices create barriers to access and unfair outcomes. But even in high income countries, high prices create access barriers. 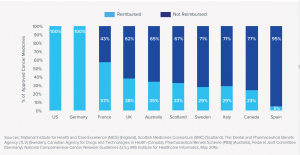 A May 2016 study by IMS Global illustrates the uneven reimbursement states for new cancer medicines approved in 2014 and 2015. Access to new cancer drugs is not universal even in developed countries, where national health systems’ priorities may result in declining to reimburse some products. Countries employing a formal cost-effectiveness methodology based upon cost per quality life year gained are much less likely to reimburse new cancer medicines than countries using other assessment approaches. By the end of 2015, 78% of the new oncology medicines launched between 2010 and 2014 were available within the greater EU. Patients in six European countries gained access to NAS within all 6 therapy categories. Only one-third of the former Eastern Bloc countries have access to at least one of the new targeted immunotherapies. Paul Miano, Cancer: Approval, ownership, market structure, and placement on WHO Model Essential Medicines List, for 100 new molecular entities (NMEs) on the NCI alpha list of cancer drugs and vaccines. KEI Research Note 2011:1.